Throughout the 2016 season, conversations about Tony Romo heading to the New York Jets have come up quite frequently. If the Jets signed Romo, they would only get a repeat of their last free agent veteran. 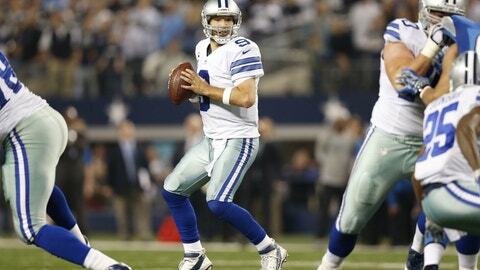 For many years, the Dallas Cowboys have had a solid quarterback in Tony Romo. However, since he’s recently been plagued with multiple injuries, and the Cowboys now have their new franchise quarterback in Dak Prescott, his time in Dallas is likely over. If the New York Jets pursued the option to sign Romo, they would only get a repeat of what they saw in their last veteran quarterback, Ryan Fitzpatrick. Fitzpatrick showed promise in his first year with New York, throwing for 31 touchdowns, and leading them to a 10-6 record. However, his age and poor arm strength showed in 2016, as he lost most of the games he started, and he threw more interceptions (17) than touchdowns (12). They would see a lot of the same in Romo but in quicker time. He would start out strong, showing poise in the pocket, making great decisions, and throwing with accuracy. However, he would eventually get hurt. He would try and come back, but it’s likely that he would either get hurt again, or he would become gun-shy in the pocket, and throw passes just to get the ball out. If this happens, we would only be back to where we are now. It is true that the Jets need to bring in a veteran, but not as a starter. They need to have a guy who will mentor both Bryce Petty and Christian Hackenberg. If they sign Romo, they would be signing a starter they don’t need. This would end up being a huge waste of money, and it wouldn’t help their team in any way, shape or form.